I just received a text alert, just one of the many auto alerts from the service provider. It says "Are you an ultimate diva or a super goddess?" Hmmnn i paused for a moment and pondered. Then i realized i'm never a diva, let alone a super goddess? What am i then? Ngeks! This post is for Carlota's contest... i've got no time already so ill just pass. But i'll udpate this later to post my supposedly photo entry. The instruction was to post a photo of any kind then describe or tell something about the photo. 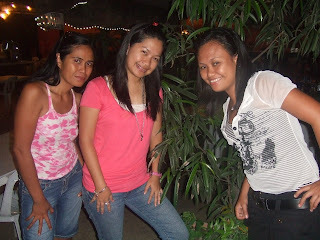 Taken last April 7, 2008 in Cagayan de Oro during our white water rafting adventure. Why this photo amongst all the other photos i have? Solely because it features a woman (me in the center) and how she conquered her fears! Charr! Hehe! Hello! I can't swim but i dared to do the rafting! :P It was one scary ride but a memorable and enjoyable one. It's a gloomy and rainy weekend here in Cebu. Is summer here totally over? Tsk! Too bad! We still have pending outings but are cancelled because of the unpredictable weather! :( The rain just come off and on. You can't really plan ahead because of it. I'm still not over with outings! waahhh! Who would not know what a silver is? It is a soft white precious univalent metallic element having the highest electrical and thermal conductivity of any metal; occurs in argentite and in free form; used in coins and jewelry and tableware and photography. I am fan of collecting silver jewelries. They are fun to look at and not so intimidating in appearance. I'm sure, there are lots of other people out there who are into collecting silver also. This is a hobby that collectors find it worth investing. If you'd like to find and buy the rarest silver collection there is, check out the silver items from Monex. They have silver bullion and silver coins like the silver vienna philharmonics, silver american eagles, 90% silver U.S. coin bag, 40% silver U.S. coin bag and silver canadian maple leafs. A little trivia for you, a silver bullion is a durable, divisible, convenient, has a utility value and cannot be created by fiat metal. If you are not so sure about what to consider in buying silver. Call them now and a personal advisor will answer your queries. Alright! Alright! The design and content of each blog is according to the discretion of the owner. I know that and I respect that. However, me as a blog hoper and lurker have this thing on others' blog that i kind of don't like. I really don't like it when the blog doesn't have a picture nor a written profile about the author. Especially if it's a personal blog which is always the case of the blogs i often visit or exchange links with. I mean you read their blogs because you want to connect to their views, experiences, thoughts and rants perhaps but i find it less interesting if i cannot relate who the blogger or owner is. For mysterious reasons, without profiles might be catchy. Others may opt that way for privacy. Either way, I really prefer to read and lurk blogs with profiles especially if i don't know the blogger personally or i just met him/her online for the first time. There are exceptions though - that is when the entries or post are really interesting that i wouldn't mind if i do not know who the author is. Hmmnn i just revised my not so 'active' pinky blog... do visit it when you have the time! I have here another interesting tag from Francine. Thanks girl for this one. :) I am tasked to list down my top 5 things to do, so here it is. 1. Wait for a specific date in the calendar. 2. From #1, I have to decide between option A or B. 3. If i'll choose option A, then save all my files, process all my papers. 4. If i'll choose option B, then still save all my files, concentrate on current tasks. Now, what the heck am i talking about? You will know soon enough. This post is the continuation to my previous entry on meeting another Bisdakplanet member. 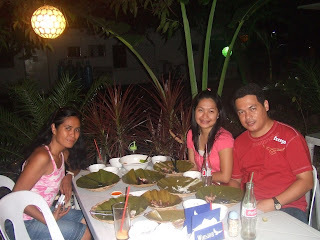 Glorie and I picked up Chikai and her husband at Pier 6 last April 29 at around 9:00pm. Since it was a bit late, we were left with few choices on where to eat. 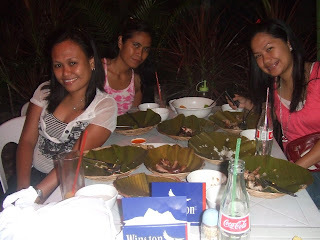 So we ate our dinner at NeoNeo Grill in Mabolo. We then just toured around the city (Waterfront, Paseo, IT Park, Mango Avenue) for an hour or so. Glorie and I thought that the couple must be tired from the entire boat trip from CDO. wala mi lain maposingan! salamat sa tanom heheh! 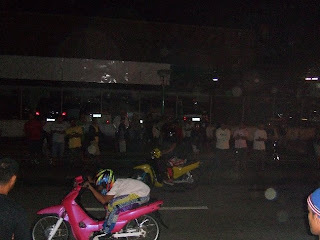 When i was still a kid, I used to watch motocross competitions in Reclamation Area. 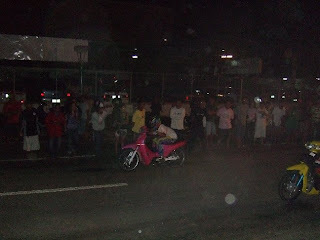 The excitement that i used to feel then ignited when I watched the motorcycle drag race last night. It's frightening looking at those riders almost delivering themselves to death but 'twas cool at the same time. Saturday night could have been cooler since cars were racing but we were not able to catch it. Better luck next time! I was at a baby shower before i watched the drag race. Details on a separate post. In this modern times, life insurance is somewhat a necessity. There are lots of insurance companies out there and before you apply for any, make sure you know what you're applying for. One of the insurance firms you can count on is Life Insurance. Life Insurance is unique among financial instruments. Why so? It is one of, if not the only financial instrument that is based on caring and love. Having insurance has personal advantages but it is the love for those we care most about that matters - making sure they are taken care of. Learn more about Life Insurance and know the terms and all the important factors in applying insurance. Go visit their site and get a quote instantly by applying for an instant life insurance quotes.